Network security monitoring is based on the principle that prevention eventually fails. In the current threat landscape, no matter how much you try, motivated attackers will eventually find their way into your network. At that point, your ability to detect and respond to that intrusion can be the difference between a small incident and a major disaster. The book follows the three stages of the NSM cycle: collection, detection, and analysis. As you progress through each section, you will have access to insights from seasoned NSM professionals while being introduced to relevant, practical knowledge that you can apply immediately. If you've never performed NSM analysis,Â Applied Network Security MonitoringÂ will help you grasp the core concepts needed to become an effective analyst. If you are already working in an analysis role, this book will allow you to refine your analytic technique and increase your effectiveness. You will get caught off guard, you will be blind sided, and sometimes you will lose the fight to prevent attackers from accessing your network. This book is about equipping you with the right tools for collecting the data you need, detecting malicious activity, and performingÂ the analysis that will help you understand the nature of an intrusion. Although prevention can eventually fail, NSM doesn't have to. ** Note: All author royalties from the sale of Applied NSM are being donated to a number of charities selected by the authors. 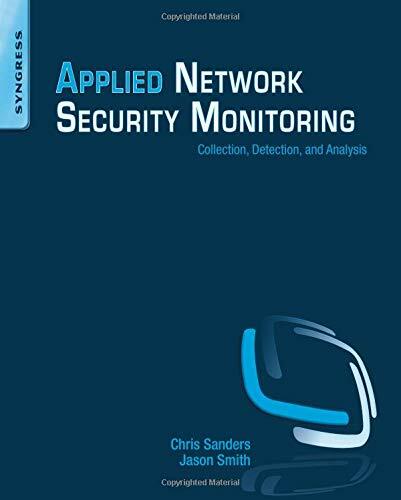 About: Applied Network Security Monitoring is the essential guide to becoming an NSM analyst from the ground up.